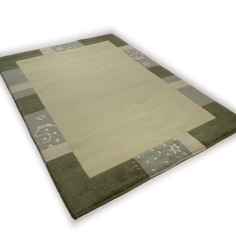 Are you looking for a plain centre rug? Maybe to place a coffee table on or to break up a heavy patterned carpet or decor. If so our Ganges rug collection could just be the ticket. Ganges are hand-knotted in India from wool mixed with synthetic fibres. The plain centre is complimented by a gorgeous, simple but highly effective border. Available in six colours, all in a wide selection of sizes.